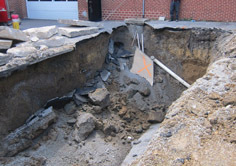 P. Joseph Lehman, Inc., Consulting Engineers was retained by C & J Falchini of Ebensburg to remove one 10,000 gallon steel Underground Storage Tank (UST), associated piping and product dispenser from a former GMC automotive dealership. The scope of this project was first to determine if the client would qualify for PA Underground Storage Tank Indemnification Fund (USTIF) reimbursement if gasoline impact was confirmed in soil or groundwater. We assisted the client in reviewing documents crucial to obtaining 100% USTIF coverage, and provided oversight of the removal, regulatory sampling/reporting, and UST Closure Report preparation. Potential gasoline impact was identified in the field and soil samples were collected for laboratory analysis. Laboratory analytical results confirmed the suspected release. The client secured 100% fund coverage for characterization and clean-up of the release. Lehman Engineers has completed the USTIF SCR-Work Plan and installed soil borings and groundwater monitoring wells to delineate gasoline impacts. Soil vapor, soil, and groundwater impacts have been fully characterized on and off-site. We are also assisting the client in obtaining a relief of liability letter from PADEP.